Roland Culver's autobiography, which scarcely mentions his films, was called Not Quite a Gentleman (1979), but it would have taken a very practised cinemagoing eye to notice the difference as he made his way through about 90 films. He could be corrupt as in The Ship That Died of Shame (d. Basil Dearden, 1955) or blinkered and blustery as in Rockets Galore (d. Michael Relph, 1958), but rarely ungentlemanly. Born in London on 31 August 1900, after WW1 experience as a RAF pilot, he trained at RADA. 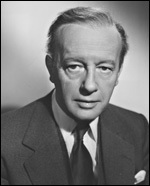 He starred on the stage (debut 1924), and was moving as the non-gentleman father in Five Finger Exercise (d. Daniel Mann, 1958), but not on screen, which gave him good character roles within a quite narrow range, though the deftness of his timing and his way with a dry line shouldn't be underestimated. There are numerous lords and colonels among his films, but a rare exception in a minor film - a tenacious police inspector in The Late Edwina Black (1951) - stays in the mind among such clubbable types as John Justin 's old friend in The Man Who Loved Redheads (1954). He was in Hollywood from 1946-49, initially to play a benign aristocrat in To Each His Own (1946), and on TV he was a memorable Duke of Omnium in The Pallisers (1974). His son is actor Michael Culver .